"Your Lakes Area Custom Goldsmiths"
The Loupe – a “magnified view” of our business. A little “Sparkle” for a Christmas bride! We wish you a Married Christmas, for a Happy New Year! At R.W. Jewelers we are committed to making each and every bride feel special and unique. Her wedding ring is a reflection of her style, her personality and the love she shares with you. 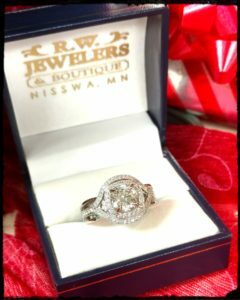 Put the “sparkle” in her Christmas this year with an engagement ring from R.W. Jewelers!